Looking for a few more free sounds for Computer Music's exclusive granular sampler plug-in, Cumulus? Then perhaps you should download Cloud Industry, a selection of presets by AbstractCats, a name perhaps familiar to Cumulus users: he was a major contributor of sample content and presets to the Cumulus Factory bank. Cumulus is a granular sampler which radically transforms sample content by breaking it into tiny slithers of audio called grains and reorganizing them to form new sounds. Cumulus is capable of a wide ranges of timbres: from evolving atmospheric soundscapes; to organic physical textures. Up to eight Scenes can be created; a Scene corresponding to a particular sample position and set of synthesis parameters. Scenes can be played in realtime via MIDI, or arranged internally using the built-in sequencer. Cumulus is available as part of CM Studio. The complete, full, unlimited version can be found on the cover-mounted DVD of any issue of Computer Music. 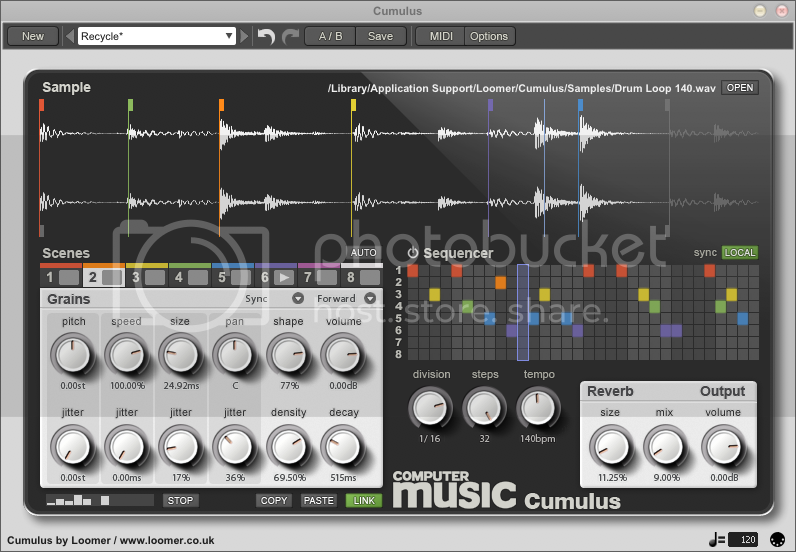 Cumulus is available in VST, Audio Unit, RTAS, and standalone formats for Mac OS X, Linux, and Windows.